Its times like these, when I’m sitting here writing this post with one hand while the other polishes off my second piece of kibbe bil sanieh, that I look up at the sky and thank God. I mean how perfect could a piece of pie be? For those of you who are not familiar with cooking from this part of the world, or with a meat pie for that matter, you should probably jump on the bandwagon right about now. My grandmother Helena, my mother’s mother was originally from Syria. She and her family emigrated to Israel at a young age, when Jews were no longer accepted in certain Middle Eastern countries. She married my grandfather Victor in Tel Aviv and they moved around the world, trying to find a good place for their family to settle. Eventually, after a stint in the Phillipines and two filipina kids later, they decided upon America. Growing up in a very middle eastern environment with very strong identity, my grandmother was not willing to let go of her traditions too easily, and boy am I happy about that. What did this mean for me? A childhood filled with all different kinds of Syrian dishes – laham bajeen, sambusak, kibbe hamda, kibbe cherry, just to name a few. One dish that she never failed to make for her grandchildren was kibbe, crunchy topedos filled with a spiced beef centre. She would sit for hours forming these torpedoes, just as she had learnt from her mother. When we weren’t with my grandmother, my sisters and I were lucky enough to learn the recipe for these torpedoes from our mother, one that is sure to be passed down for generations. Unfortunately if you’re craving kibbe, you’ll be waiting a while to reap the benefits. 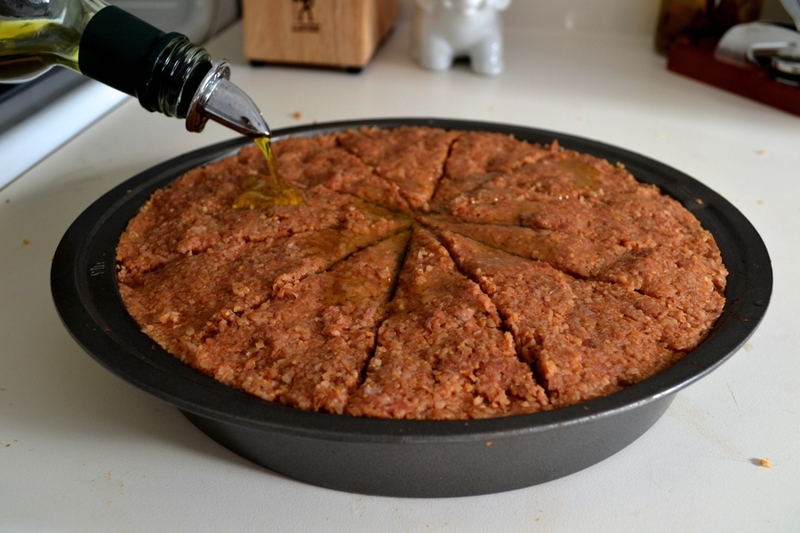 You have to set some time aside to make the crust and filling, and master the art of torpedo/kibbe making, a very tedious task. This recipe uses the same ingredients as the torpedoes, but takes the form of a pie, making that crunchy forkful you’re craving so much closer. Grandma Helena, they’ll be sure to thank you all later. 1 3/4 cups bulgur, rinsed in cold water then drained well. Heat a pan on medium-high heat. Add in the olive oil then the chopped onions. Sautee for about 4-5 minutes until translucent. Add in the beef and sautee until cooked through and slightly brown. Remove from heat. Add in the allspice, pine nuts and salt, mix well. 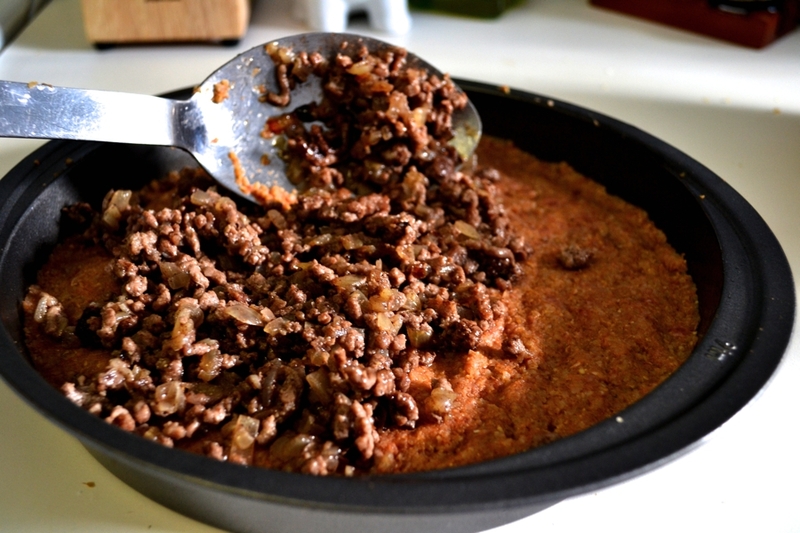 In a large bowl, combine the ground beef and bulgur together, mixing well with your hands. 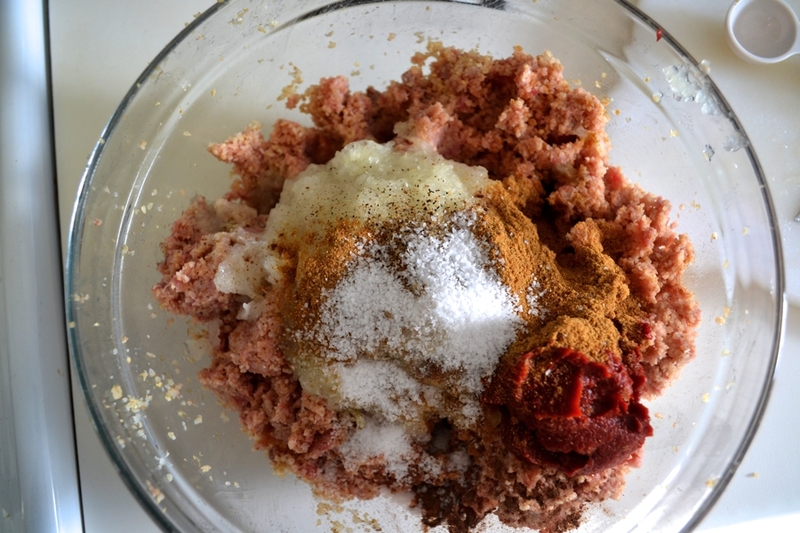 Add in the grated onion, allspice, cumin, tomato paste, salt and pepper then mix again with your hands until everything is combined well. Grease either a rectangular or square baking dish. Press half of the crust mix into the bottom of the baking dish. Top with the all of the filling then cover with the remaining crust. Using the tip of a sharp knife cut into triangular pie pieces if using a round pan, or squares for a rectangular pan. Top with the remaining olive oil and bake for 1 hour until the top crust is golden and crispy.